Own an SCT tuning device and want to have the most advanced, safest, most reliable custom tuning available on the market? Then purchase our Lifetime Tunes option and receive our Steeda Certified Custom tunes for your vehicle for as long as you own that vehicle and tuning device. Steeda Certified Custom tunes pass our rigorous standards for performance, durability and driveability and have an impeccable safety record. Developed and tested on our in house dyno as well as through hundreds of hours of field testing both on the street and some of the most demanding race tracks in the country, you can be sure our tunes will deliver safe, reliable power. Custom tuning is delivered via email. Delivery times is 3 to 4 business days. If you are ordering separate products do not install your products that require tuning until the tune has been delivered. Improved horsepower, torque, and throttle response. I wanted to say thank you to Matt and the crew at Steeda. Y’all were amazing at helping me and providing excellent customer service. The tunes I received are exactly what I was looking for. I have tried a tune from another company and for me there is no comparison. The Steeda tune works perfect. There is no cold idle issue. There is no wot issue. There were no adjustments that I had to make. The tune wasn’t too hot and I had to make timing or fuel adjustments like I had to do on a competitors tune. I’m not bashing them. But your tune has just been that great. Thank you very much!!! This is a shout-out and a note of appreciation to Matt H. and the entire tuning team. Matt went above and beyond to answer all my stupid questions, and help me get the right tune for my car. The results were nothing short of amazing. The car had another Brand tune on it when I bought it, and it never ran quite clean. Tried to get them to fix it but could never get a live person on the phone. The Steeda tune came with clear instructions how to update my tuner, as well as how to load tunes. Easy. My Mustang had a nasty torque dip stock and with previous tune at about 3k as it comes on the cam. The Steeda tune cleaned up the midrange and it revs out faster to the top. I haven’t had it to a dyno, and I am more of a track guy. The cleaned up midrange and drivability made for faster times. If you are deciding on a Mustang tuner, go Steeda. The people and the product are all top quality. Steeda Tunes are Spot On!! I have had Steeda provide custom tunes for my 2016 Mustang GT since I began to add performance modifications. FIrst, it was in conjunction with the Steeda Cold Air Intake. Later on I required a tune for long tube headers; and most recently a modification to the throttle response (drive-by-wire). Each time the tune provided by Steeda has been exactly what the car needed to take advantage of the modifications; with no trouble lights, hiccups, or unexpected issues. There are plenty of tuners out there, but Steeda really knows what they are doing. An added bonus is the quick turnaround time to receive the new tune via email. I’ve had the Steeda tune installed for about 2 weeks now. I’ve done a good amount of well-rounded driving since having the tune installed. I’m pleased with it overall. It’s subtle down low (idle to 2750), but far better than the stock tune. Mid and upper RPM’s are where the tune really shines (3000 to redline). The pull in the mid and upper ranges is solid and what you’d expect it should have been as stock for these cars, lol. With the windows down and the car screaming at 7000+ through the 3” exhaust I have, it’s music to my ears. It never stops pulling. I don’t think you can go wrong with one of these tunes. As a reference point I had a different brand tune on the car for 2 years and the differences are significant in all around drivability and smoothness with the Steeda tune over the other tune. I would not go back to the other provider, not only because of their poor customer service, but the tune as well. Steeda delievered my tunes in less than 24 hours of purchase, and they were able to make a revision after I tried to load them on my SCT in less than 30 minutes of emailing of the issue (I had given the wrong S/N on my unit). Great customer support and I’m happy and satisfied with the purchase and end result with my ride. My 2015 GT is the 4th vehicle I have enrolled in Tunes for Life with Steeda. They continue to impress so I continue to come back. I have this paired with the Steeda CAI on my GT and the difference is unreal! I did not expect the 93 octane tune would do so much, as the car's driving manners at part throttle and cruising are so smooth and factory like. At WOT, though, hold-on-for-your-life. The difference in power throughout the curve, throttle response and the speed with which the car climbs through the tach will have you giggling like a school child each time. My tune was delivered in 1 business day - talk about prompt service. Thanks again Steeda! Received an email with the completed tune at 4 PM. Yes, only 2 hours later!!!!!!!! 2014 Mustang GT - Long Tube Headers, Cold Air Intake, X-Pipe w/high flow cats, GT500 mufflers. 93 octane. 3.73 gears. Contacted Steeda on 07/01/16 at approximately 2 PM, placed an order for a tune with the listed mods. Received an email with the completed tune at 4 PM. Yes, only 2 hours later!!!!!!!!!!! I was so shocked that i called and asked if that was the actual tune. Anyways, the car runs great and the customer service at Steeda is by far the best. 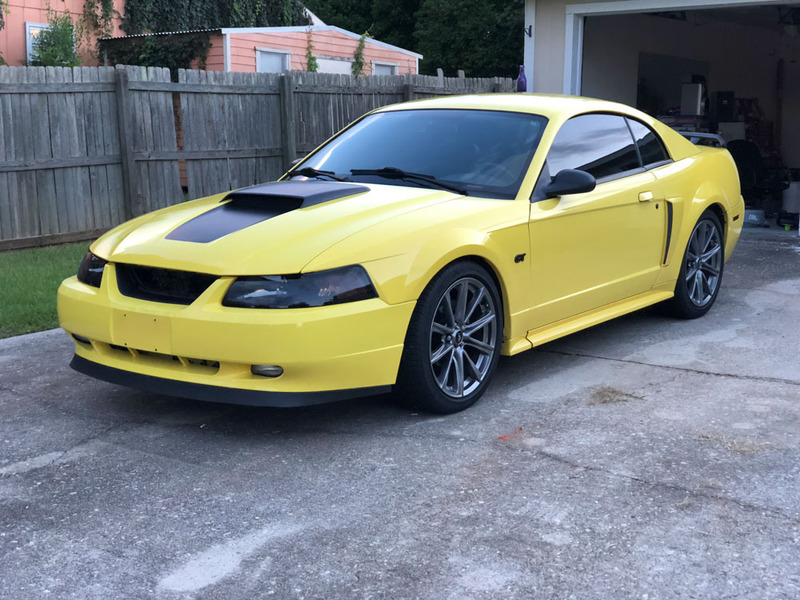 I have dealt with many mustang mod companies over the past two years, but Steeda is by far the best. Went through another company for tunes for years. The last tune I got from them with the Steeda CAI was terrible so I simply removed the intake. I decided to try the Steeda tune and can say I will never go back. More power, smooth idle, and stock like drive ability until you step on it. I almost sold my intake due to it just sitting around in the garage. I'll never take it off again. Loaded up my new Steeda 93-octane tune today, with the Proflow CAI restrictor tube removed from the MAF housing. NO MORE REV-HANG! The car shifts just like stock, and the rpms drop right where they need to. The car feels great with the bigger MAF housing, and an awesome tune by Steeda!! you can spend your time at the performance shop letting them work it out at $75 - $100 per hour or you can get it straight from the guys who have already proven it out. i am very happy and am sticking with Steeda. i purchased the CAI for the 2015 and i cant say enough. Great job Steeda! First let me start off by saying that I received the steeda tunes i ordered shockingly fast in under 3 hours of ordering them. Now i need to tell you the truth. You need to order these tunes immediately for your modular mustang. I have a 2011 5.0 coyote and was running Bama tunes for the past few months and i didnt know what i was missing. I asked steeda for a conservative 91 octane and a more aggressive 93 for the strip and so far the conservative 91 is running less timing and better AFR than the Bama and feels so much smoother and more powerful. It idles perfectly, better than stock with no little heart murmur that everyone with a cai experiences at idle. Im so impressed, and would but these tunes again in a heartbeat. Im never going back. I continue to be impressed by Steeda. My requests for tune revisions are completed in 24 hours and more importantly, the tunes themselves are the gold standard. I picked Steeda for it's reputation and I now know that reputation is well deserved. I hope you take it for the complement it is when I tell you the throttle response and modulation is BMW-like. I have tried other tunes and without fail come back to Steeda because the throttle is perfect. I installed the tune and put a few driving cycles on it yesterday and am quite pleased. The car seems more eager to rev. It shifts a bit smoother since I am now shifting at a slightly higher RPM as a result. This is a happy by-product I did not see coming. It does indeed feel more powerful in the low to mid-rpm ranges. It is a nice upgrade. I am most impressed with the tunes ability to retain stock driveability. There is no surging, no lurches from hanging RPMs, and power delivery feels more linear. I was worried about this due to past tuning experiences, but my worries were unfounded.I am not really interested in peak numbers, just how fun the car is to drive, so there probably won't be any dyno testing. I purchased the SCT X4 tuner along with the Steeda CAI through another site about 6 months ago. Did a few other things along the way too (BBK 85mm TB, Axle-back exhaust, GMS Pro-Series COP's). I was using the SCT pre-loaded tunes that came with the tuner. There was a noticeable difference in performance compared to stock but something was definately off, especially the throttle response. Decided to go with Steeda cause they're here in FL were I'm from and live along with their reputation. All I can say is WOW what a difference!!! The car feels so much quicker, throttle response is crisp, and there's no hesitation during WOT. It's just a smooth hard pull all the way to the redline. I couldn't be happier with the decision to use Steeda for my custom tune. Next... headers! I have the tunes for life with another well known company and they were having trouble tuning my 14 GT with basic bolt-ons. I had problems with acceleration and my car had no power and was not fun to drive. After a frustrating 2 month back and forth period with them, I decided to search for a different company to write tunes for my car. I decided to go with Steeda because I have not seen one bad review about their tunes and because of their close relationship with Ford. I called and talked to a tech and he was really friendly and knowledgeable so I went with the tunes for life with Steeda. I filled out the online tune build form and within no time, they had delivered my first tune. I loaded it up on my car and went out on my first test drive and I was pleasantly surprised. With their first tune, they had fixed all of my issues! My car had all of its power back and then some! It was a blast to drive and I was smiling the whole time! What set Steeda apart was that I was able to tell them what my car was doing and with their first tune sent to me, they fixed my issues. They are extremely professional and proficient in their trade. I will be a customer for life. Fast tune updates from Steeda - every time I add a mod I let them know and they send me a new tune! My GT is a bone stock Auto. Fun to drive right from the start but two things really needed to be changed. Throttle response and the very conservative shift logic from Ford. I wasn't too interested in getting firmer felt shifts, but those just add to the package. I have the Custom Performance Tune for my car and it made a night and day difference! What impressed me the most is the throttle response. Almost telepathic. Really. I just think about going faster and the car launches. Even at cruising speeds. The gears hold longer during acceleration to use the meat of the power band and downshifts are quick and there when you want them to be. I recommend this tune to everyone who has an Auto equipped GT. I would go so far as to say this is a necessary upgrade and how the car should behave when it comes off the lot. Communication to the Steeda team is quick and highly responsive. If you feel the tune needs to be tweaked to your desires, they make it happen. Bottom line is that I love their product and would highly recommend them to all Mustang owners.